← Love Thy Neighbour! Sorry Who? 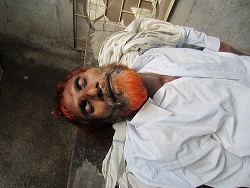 Niamat Maish a poor old Christian resident of Chak No 149 EB Arifwala Drisrict Pakpattan in Province of Punjab Pakistan is reported to have died due to police torture in Saddar Police Station Arifwala, Punjab Pakistan. Local Christians staged a protest demonstration against the brutal act of Police and demanded Chief Minister of Punjab, Shahbaz Shrief, to register first investigation report (FIR) against police murder. It is reported that in month of September, a FIR was lodged against Asif Imran, son of Niamat Maish under section 365B of Pakistan Penal Code against the abduction of Muslim girl Shazia Bibi whose father lodged a complaint in the Police station on 2nd ofOctober, 2012. The allegations were brought up against Niamt Masih´s son, Asif Imran in mid September to marry a Muslim girl. Police arrested Niamat Maish and tortured him in the Police Station later they took physical remand from Magistrate in Arifwala, Punjab, Pakistan. Due to the severe torture and his old age Niamat Maish fell unconscious and was brought to Civil Hospital in Shaiwal and later due to his injuries he died in the Hospital. case against Police degrading, inhuman and brutal act of murder. This entry was posted in News and tagged blog, Christian, christian blog, christian news, christian news blog, Christian persecution, Reports, South asia, World News. Bookmark the permalink.